Fashion Show | A Guy, A Girl, and a Really Old House! Tony’s been in charge of the Personal Project this year, which is the culmination of the Middle Years Program in the International Baccalaureate. He’s been working with the 10 tenth grade students, trying to guide them through the process of choosing a project, researching the topic, organizing and gathering materials, then presenting it. The students’ projects are coming due now, then they’ll have to write everything up in a massive paper. 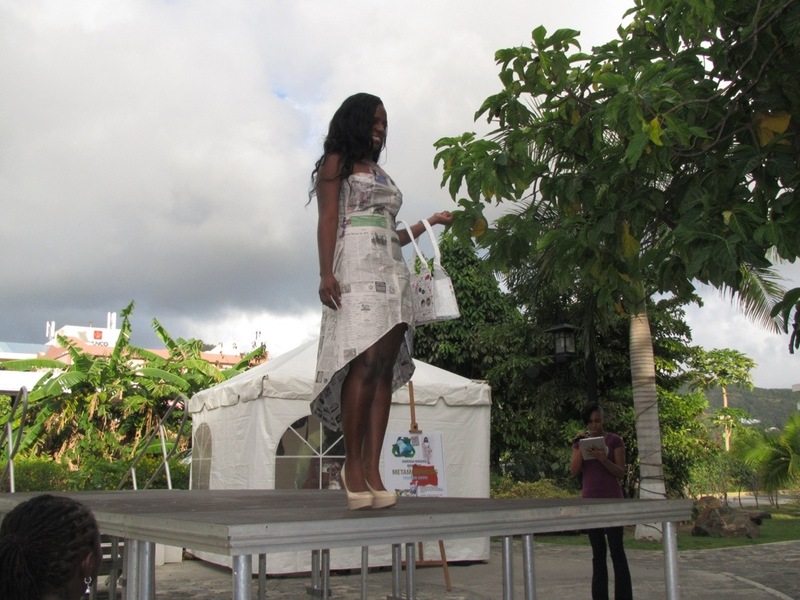 This two piece suit/dress was created from magazine pages and lined with air mail bag material. She actually sewed everything together! 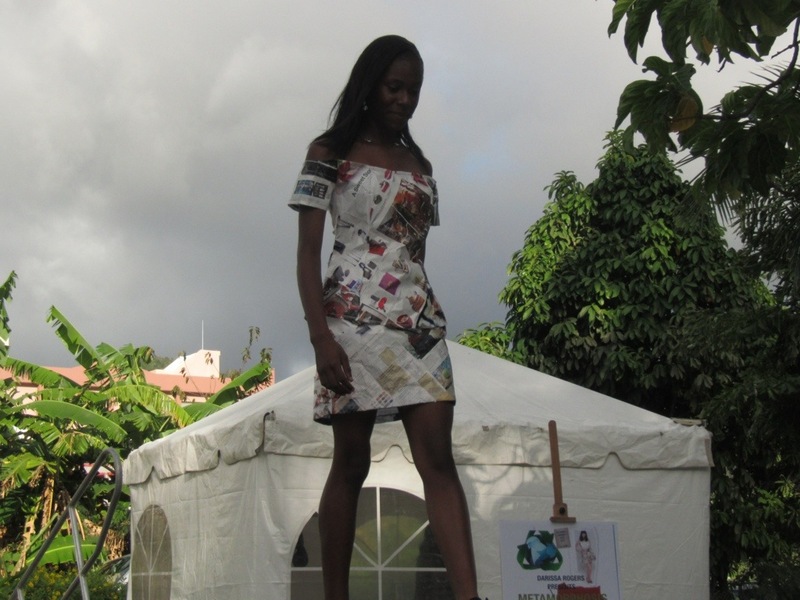 The next two dresses are made from newspaper, lined with those same mail bags. 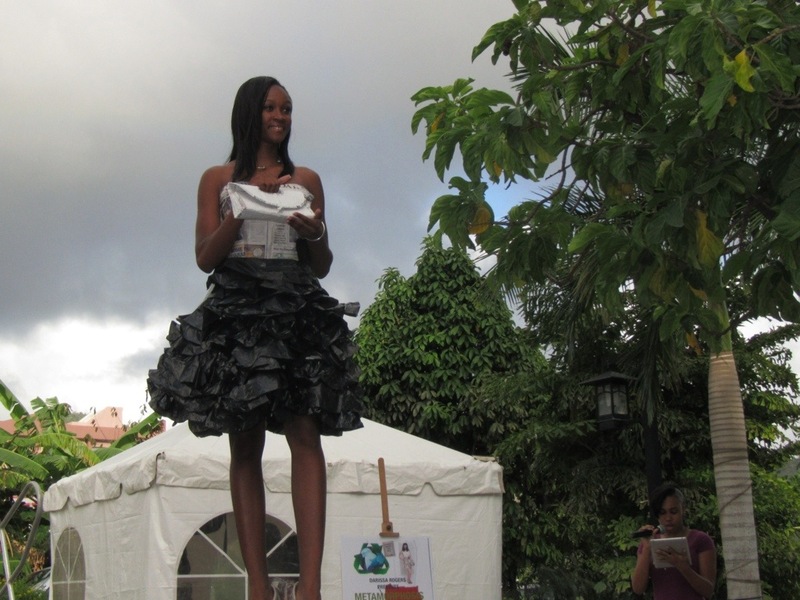 She even created purses and jewelry out of cardboard, paper, glass bottles, pop tabs, and electrical wire. This one was my favourite, with the flouncy skirt. It’s newsprint on the top and the skirt is black trash bags! The whole show went really well, and thankfully, those rainclouds in the background held off until just after everything finished. Here’s a picture of all the models with the designer. I was impressed! That is just stunningly cool!!!! I will send you all those pics of the designers that were commissioned by MK last year to design their amazing gowns out of the product cases. Will be so great to show his student those!! So glad you had the visit with Ira and Barb! How special! Also the designs are spectacular. Nice job kids!! Very Impressive! Beautiful designs and beautiful models. Tony’s student should be very proud.